9/7/14 I’m on my way home! Yay! Yesterday we went to breakfast at The Hungry House with Maxine. It was raining and cold after the 90 degree heat of the day before – a shock to find it in the 60’s. 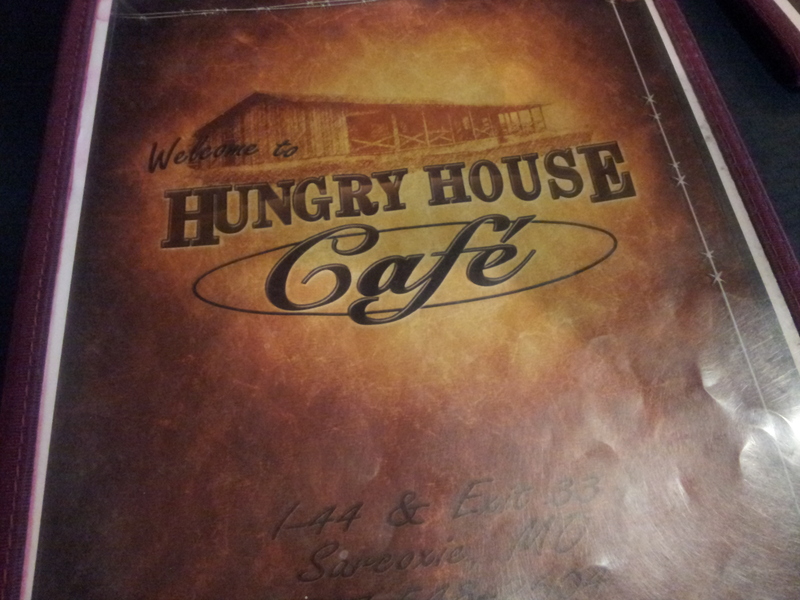 The Hungry House is the only restaurant anywhere near Sarcoxie and it’s out on the highway. We take the back roads to get there as directed by Maxine. I’ve given up after The Sirloin Stockade and the corn dog at Chief Sarcoxie Days last night and decided to eat until I go home. I can’t win. I know Janet will have a spread at her house later. 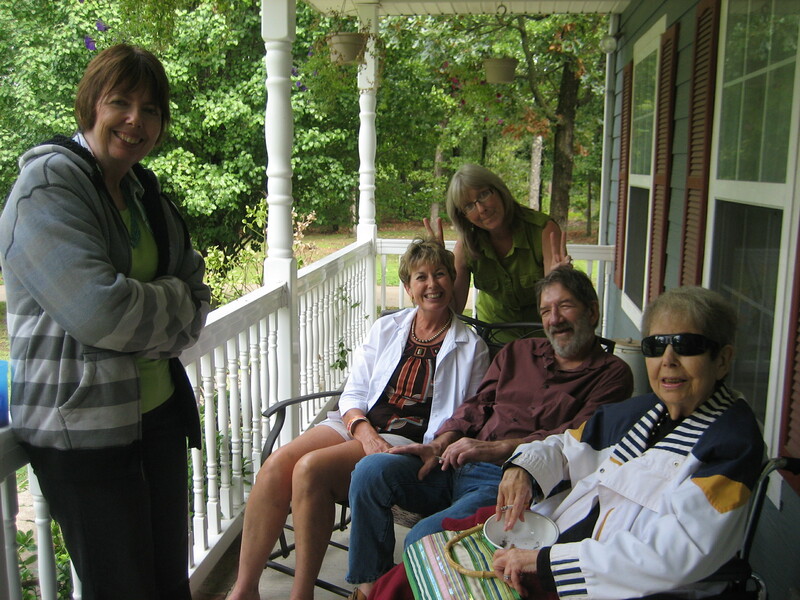 After breakfast I visit Loretta (my dad’s cousin) who lives two doors down. She’s 102 and is thrilled when anyone stops in to see her. Her family has suggested maybe she should move into the local nursing home. She’s stayed there previously and they were nice to her and it was fine but she doesn’t see why she should go there if she’s still able to take care of herself. She apologizes for forgetting things, but I think when you’ve got 102 years of memories you’re entitled to forget a few now and again. Steve and I find Janet’s house with no difficulty. 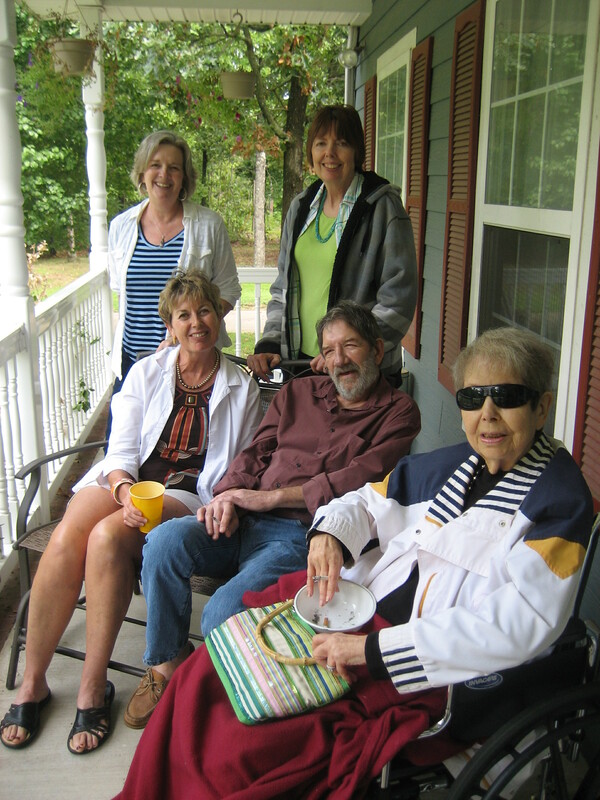 Her sisters Cheryl and Connie are there along with assorted spouses, nieces and nephews and my uncle and aunt. It’s delightful to see everyone and watch them interact . I have to remind myself I’ve known these cousins since childhood. I saw them every summer. Now Cheryl is a grandmother and Connie will be one soon. They’re both a little older than me so it’s too early to panic. I don’t know how Janet does all she does. She’s one of those perennially sunny-dispositioned people who make every event and every challenge appear to be a breeze. She turns every accident into a funny story – as when the coffee carafe breaks and leaks water all over her kitchen counter. Twice. Cheryl has made a Boston Cream Pie that looks like a picture in a food magazine. Connie’s made apple pie with Missouri apples. Apparently the closer to home the apples are grown the better the pie. I initially decline dessert but eventually succumb. I’m on “vacation” after all. We chat and play musical chairs to chat with someone else and take pictures. Janet takes most of them. If her camera is digital (surely it is) I hope she sends me copies so I can share. On the way home Steve and I stop to see Mom again. She’s already sitting at her place in the dining room even though the lights are off and dinner won’t be served for 45 minutes. I’m pretty sure she has no idea who we are but we sit and chat as best we can. Oddly she knows all five of her brothers’ names (in order) and her sister’s name. Her parents’ names and her own. Her husband’s name. “Who could forget him?” she asks…without a trace of irony. When Mom’s tablemates start moving toward their seats it’s our cue to leave. Mom has told us she’s hungry from the moment we arrived. But when I offered her an overripe banana from a basket on the counter she declined – preferring to wait for her meal. But I know what she was really waiting for was dessert. I always thought my love of dessert came from Dad, but maybe it came from Grandmother?